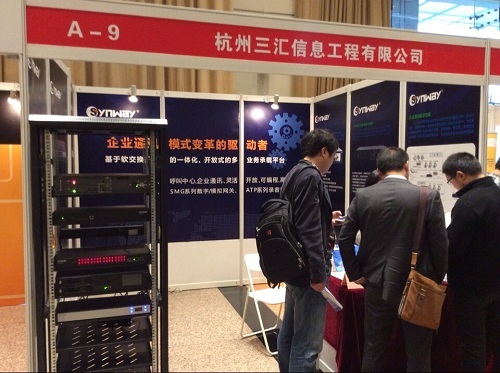 [HANGZHOU, CHINA] May 4th,2014-- As a world’s leading professional manufacturer and provider of telecom equipment, Synway Information Engineering Co.,Ltd. highlighted its SPBX products and introduced the portfolios of its innovative NGN-based platform at the the China Customer Contact Center & BPO Conference 2014 in Shanghai. Interconnected & Integrated:Compared with legacy IP-based technology, softswitch technology enables end-users, system developers and operators to have opportunity to enjoy various multimedia applications including data, voice and video communication more cost-effectively and flexibly in mobile Internet era. Effective & Flexible:Separating BLL and control layer from core equipment while remaining the benefits of IP switch, softswitching framework offers great advantages in introducing new business more rapidly and efficiently than ever, which consequently drives the service delivery time down.It is the high demand in diversity and instantaneity that facilitate the rapid development of softswitch technology. Highly Interoperable:Catering to the needs for convergence of telecommunication network, computer network and cable TV, SPBX introduces standard protocols to enable all network components to perform independently while owning high integration and interconnectivity . Depending on dedicated spirits and considerate service, Synway impressed the attendees once again with its field-leading competitive products and solutions and would definitely outshine other manufacturers in communications industry in a long way.